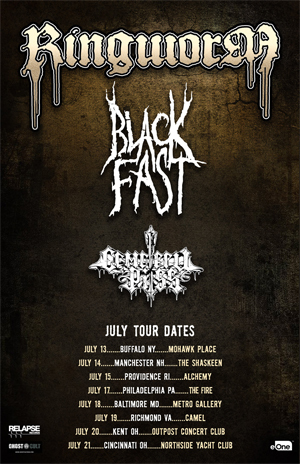 Cleveland’s RINGWORM announce US East Coast headlining tour dates throughout the month of July. Direct support will be provided by BLACK FAST and CEMETERY PISS. RINGWORM will also tour with labelmates SKINLESS and OUTER HEAVEN plus CHURCHBURN in June. All confirmed dates are available below. Additionally, RINGWORM recently entered the studio to record the follow up to their 2016 album Snake Church. The new album is being tracked and recorded in the Cleveland area at Brainchild Recording Studio in with Noah Buchanan (MIDNIGHT, EMBALMER) and Spider Studios with Ben Schigel, who recorded their past several releases. The album is planned to be released in early 2019 via Relapse Records. Stay tuned for more information in the near future. Order and stream RINGWORM’s discography via Bandcamp. A full collection of RINGWORM music videos is available via YouTube.